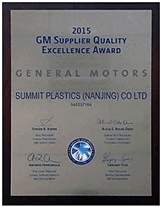 Summit Polymers Nanjing Recognized by GM with 2015 Supplier Quality Excellence Award - Summit Polymers, Inc.
After being awarded “Best Practice Recognition” in 2011 and “Platinum Customer Care and Aftersales Certificate of Excellence” in 2013, Summit Polymers, Nanjing, China has continued to win General Motors Supplier Quality Excellence Awards in 2014 and 2015. The award recognizes those suppliers who have demonstrated the highest levels of quality performance over the previous 12 months. Summit Polymers, Nanjing, China continues to deliver sustainable quality, price and service to our customers and recognizes the hard work and wisdom made by the 700 people we employ. 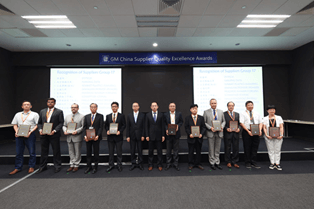 The awards helps SPI build a strong Employment Brand in the local talent market by showing current and future employees that Summit Polymers, Nanjing, China is one of the best choices people can make for their career.